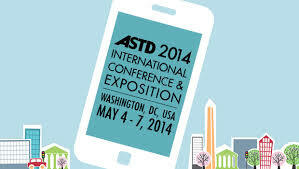 ASTD International Conference 2014, Twitter, and Staying Connected: No Longer Left Behind—Again! The news that I made a new friend by participating in the American Society for Training & Development (ASTD) 2014 International Conference & Exposition (ICE) today isn’t particularly noteworthy. The fact that I unexpectedly accomplished this with the help of two other people who weren’t physically attending a conference that I, too, am not physically attending does, however, suggest that there is a worthwhile story to tell any trainer-teacher-learner who is interested. We’ve heard quite a bit suggesting that social media tools make us lonely; that it’s time to deliver “A Eulogy for Twitter” as “the beloved social platform enters its twilight”; and that a social network can’t replace a “real” one (as if everyone who uses social media makes this an either-or decision). What isn’t as often heard or read is the idea that being left behind when we are not able to physically join our friends and colleagues at wonderful professional development gatherings like ASTD ICE, American Library Association (ALA) conferences, and the numerous others that beckon is increasingly less of a problem than it was before social media tools came our way. As I have continued experimenting with the use of social media tools in workplace and personal settings over the past several years, I’ve become intrigued by the possibilities they offer in terms of not being left behind. With that in mind, I tried a spur-of-the-moment experiment with ASTD colleagues last fall by trying to participate in an ASTD conference I was unable to physically attend. And while the last-minute nature of that experiment limited the number of exchanges I had with those onsite colleagues, I did unexpectedly encounter one sign of success: interacting with onsite participants by responding to tweets rather than just retweeting content for others caused a couple of people to ask if I were actually there. When we see the lines blur so much that offsite participation creates the sense of onsite interaction, I believe we have, in the best of situations, moved beyond the idea that we can’t be there unless we’re there. The inspiration to retry the experiment with more deliberate planning came after another ASTD colleague, Larry Straining, posted a note on his Facebook account to let others know he was sorry he wouldn’t be physically present this week, but that he was looking forward to seeing tweets from conference attendees. 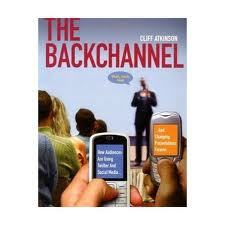 “If we follow the backchannel a bit and interact as time allows, we might extend the reach of the conference in significant ways and, at the same time, learn even more about how to effectively incorporate social media into our training-teaching-learning process,” I wrote in response—and that’s exactly how it played out today as I followed, responded to, and interacted with onsite colleagues from the comfort of my own home. It probably goes without saying that I laughed out loud when I discovered that my retweet of Kent’s piece was itself, retweeted by others—including Melissa Daimler, who serves as head of organizational effectiveness and learning at Twitter and also serves on the ASTD Board of Directors. It’s worth noting that one very important element making this level of onsite-offsite interaction possible is the existence of a very strong backchannel among the first-rate trainer-teacher-learners who are at the heart of ASTD. The quality of the tweets from ASTD conference attendees is among the strongest I encounter: multiple voices tweeting individual sessions (not just notes about where to meet for drinks or swag) so that it’s possible to gain a sense of what is being discussed onsite; combined with the use of a conference app that is easily accessible and includes schedules, speaker bios, session materials when presenters have made them available so we can view them from a distance, and much more; and observations which in themselves provide magnificent learning moments. As we began to wind down toward the end of this ever-evolving cross-platform series of exchanges, Kent and I returned to Facebook and Larry’s original post. “When you state in your [original “No Longer Left Behind”] post, ‘The real pay-off for the experiment came when the exchanges put me in touch with one of the presenters who had seen the retweets and comments. The result, in many ways, was exactly what it would have been if I had been onsite and meeting members of those expanding communities of learning and personal learning networks rather than feeling as if I were part of the left-behind gang,’ I would suggest it was better than a come and go exchange which includes the standard ‘business card trading ritual’ as it allowed you to follow them (on Twitter, LinkedIn, etc. and continue to learn from them beyond the 60 minutes of the session + the 5 minute rush to talk to the presenter immediately following the session,” Kent proposed. So, no, Facebook is not making me lonelier. And I’m far from ready to join others in delivering a eulogy for Twitter. And yes, it would be lovely to be there onsite at the conference with others. But if I were there, I wouldn’t have had this latest magnificent experiential learning opportunity to help me further understand, at a visceral level, what amazing tools we currently have at our trainer-teacher-learner fingertips. Each experience brings its own benefits, its own rewards. And having the opportunity to learn with my colleagues remains at the heart of what continues to draw me to these conferences and exchanges. N.B. — Here’s Kent’s latest contribution to the conversation: Twitter Activity at #ASTD2014 Through Monday May 5 . Also found backchannel participation from Michelle Ockers on her blog.